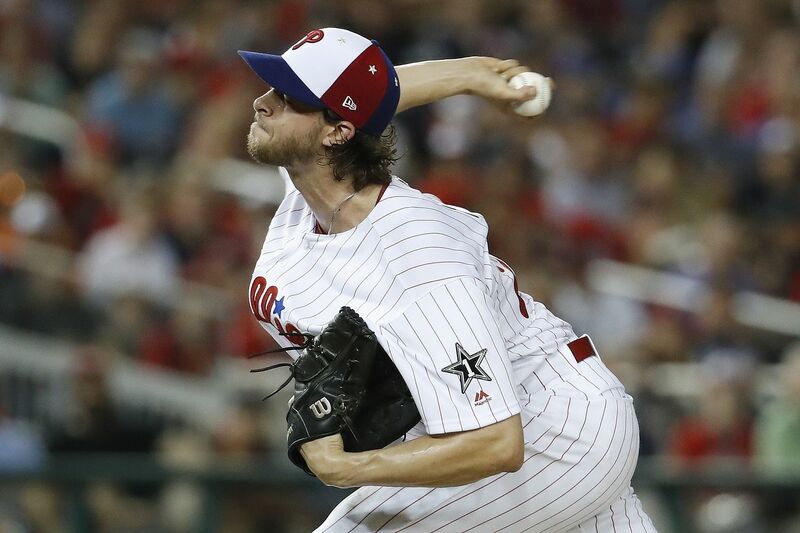 Phillies pitcher Aaron Nola during his lone inning at the All-Star Game. WASHINGTON — Years from now, Aaron Nola isn't sure what he will remember most fondly. Maybe it will be the back-to-back strikeouts of Salvador Perez and Mookie Betts. Or maybe it will be getting Mike Trout to pop out. The dugout conversation with Zack Greinke? Unforgettable. "This whole experience was fun for me," Nola said. "Definitely memorable." Indeed, Nola's first All-Star Game was everything he could have imagine. The Phillies' ace came out of the National League bullpen throwing 95-mph fastballs, an increase over his 92.3 mph average so far this season, and tossed a scoreless fifth inning of the American League's 8-6 victory that featured 10 home runs, an All-Star Game record, including back-to-back solo shots by Houston Astros stars Alex Bregman and George Springer in the 10th inning. Let there no longer be any doubt — not that anyone who has watched him pitch this season ever would — that Nola belongs among the elite pitchers in the game. And when he was through making quick work of some of the AL's best hitters, he sat in the dugout for the final five innings at Nationals Park and let Greinke bend his ear about everything related to pitching. That's what the All-Star Game is supposed to be about if you're a 25-year-old pitcher in the fourth year of your major-league career. "He's a smart guy, man," Nola said of Greinke, the Arizona Diamondbacks ace and former Cy Young Award winner. "I mean, we were talking hitting, too. He can do that. I can't do that so much. It was fun interacting with a lot of these guys." Before he arrived in Washington for two days of all-star festivities, Nola asked around about what to expect. The most common refrain: Soak it all in because it will be over before you know it. Nola couldn't get over the atmosphere Monday night, as he stood in front of the NL dugout and watched Phillies teammate Rhys Hoskins swing for the fences in a home-run derby won by Nationals star Bryce Harper, the local favorite. He was similarly struck Tuesday night when he tipped his cap to a smattering of boos from Nationals fans (NL East rivalries don't get put aside even for all-star games) and when he warmed up before the fifth inning. It wasn't until Nola left the bullpen and peeked at the scoreboard that he knew which AL hitters he would face. He struck out Perez and Betts on a total of 11 pitches, then gave up a first-pitch single to Houston Astros hit machine Jose Altuve. But he finished with a flourish, getting Trout to foul out on a 94-mph heater. And what about that velocity? All-Star adrenaline, surely. "Nah, I mean, I can get it up to 95," Nola said. "I got it up to 96 a few times last year, maybe once or twice this year. But I know I'm not going to be throwing 99-100 like a lot of those guys." It was all part of the experience for Nola, who posted a 2.30 ERA in 20 starts before the break. In a very early conversation about NL Cy Young candidates, he would have to be mentioned alongside fellow all-stars Max Scherzer of the Nationals and New York Mets ace Jacob deGrom. "He's become an incredible pitcher," Braves first baseman Freddie Freeman said. "Every fifth day that he goes out there, [the Phillies] have got a chance to win. His two-seamer, he starts it almost behind you and it comes back over. His curveball, you think you can hit it, and it drops to the ground every time. The change-up is obviously very effective. He throws everything for strikes. It's not fun facing him." At a time when the combination of home runs and strikeouts is more prevalent than ever in baseball history, the All-Star Game was reflective of that trend. There were more strikeouts (25) than hits (20), and 13 of the 14 runs were driven in by homers, including a game-tying two-run shot by Cincinnati Reds second baseman Scooter Gennett with one out in the bottom of the ninth against Seattle Mariners closer Edwin Diaz. Trout played his usual starring role with a third-inning solo homer. The Los Angeles Angels center fielder — also a South Jersey native and unabashed Eagles fanatic — is the best player in baseball but a reluctant face of the game. Earlier in the day, commissioner Rob Manfred addressed the issue of why Major League Baseball doesn't seem to market Trout more aggressively. "Player marketing requires one thing for sure: the player," Manfred said. "Mike's a great, great player and a really nice person, but he's made certain decisions about what he wants to do and what he doesn't want to do and how he wants to spend his free time and how he doesn't want to spend his free time. That's up to him. If he wants to engage and be more active in that area, I think we could help him make his brand really, really big. But he has to make a decision that he's prepared to engage in that area." The NL tied the game in the seventh inning on a solo homer by Colorado Rockies shortstop Trevor Story. Mariners shortstop Jean Segura restored the AL's lead with a three-run shot in the eighth before Milwaukee Brewers outfielder Christian Yelich and Gennett went deep to force extra innings.